Get initiated to aerobatic flying ! Duration: 1h15 including 20 minutes of ground school and 40 minutes of flight. Departures from Lachute airport North of Montreal. This package also includes the video of your flight! Take a 20 minutes ground school and get aboard an Aerobat airplane in the pilot seat with an stunt-flying instructor by your side to get initiated to stunt flying for a 40 minutes flight. You will experience barrels, looping, hammerheads etc. 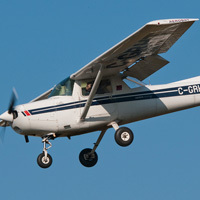 For the part where the student pilot takes the control of the aircraft, the flight will be adapted to his capabilities. A fantastic experience! Maximum weight of 230 pounds.